Dineo Dlulane began her karate career in 1989 in Port Elizabeth after being coersed by her younger brother to join the local karate dojo under the instruction of Sensei Mncedisi Bangela. She quickly progressed through her junior grades, mastering all the basic techniques and syllabus. While studying at the then University of Durban-Westville, she participated and won numerous local tournaments in Kwazulu-Natal including the SASSU games. 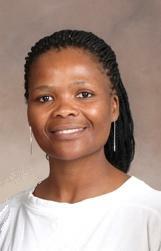 In 2003, Dineo Dlulane became the national women's champion in the under 65kG weight division. She successfully graded for her shodan (1st dan) black-belt in July 2005 under Shihan Kenny Uytenbogaardt. In May 2008, she received her nidan (2nd dan) black-belt after being graded by Kancho Hatsuo Royama and Shihan Henny Bosman. Dineo has had the previlage of participating in the international arena. In Sepetmber 2008, Dineo took part in the 2nd European Kyokushinkan Karate Championships held in Moscow Russia. Currently, Dineo Dlulane is the assistant instructor at the East London Branch of the Kyokushinkan Karate and is directly responsible for the Mdantsane dojo.